Many of the symptoms that are associated with type 1 and type 2 diabetes can be similar. In both forms of diabetes, patients must deal with high blood glucose levels, while the cells themselves are not getting enough glucose. For people with type 1 diabetes, their immune system has destroyed the cells which produce insulin, so their body is no longer able to break down the glucose on its own. For type 2 diabetics, the cells in the patient’s body have actually become resistant to the natural level of insulin that their body produces. When the cells don’t get the glucose that they need, there are a number of signs and symptoms which can occur. The symptoms of type 1 diabetes (also known as juvenile diabetes)can often be mistaken for some other medical condition. These symptoms can also appear rather suddenly and come on pretty severely. If you think that you or a loved one are experiencing any of these symptoms, then you should talk to your doctor immediately. Patients who have been diagnosed with type 1 diabetes will need to take great care in controlling their condition. If your diabetes is not properly managed, glucose levels build up in the bloodstream and this can eventually lead to other medical complications. 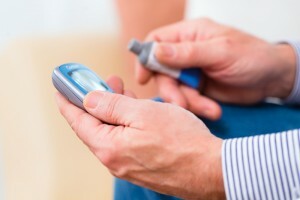 Diabetics run a risk of developing heart disease, kidney disease, nerve damage, or eyesight complications later in life. In some cases, a patient’s pancreas may no longer be able to produce enough insulin to match their dietary demands. If this continues to escalate, a person’s body can become insulin resistant, and they develop what is known as type 2 diabetes. Glucose levels can begin to build up in the bloodstream of type 2 diabetics and this can lead serious complications such as kidney failure, stroke, heart attack, and the amputation of certain limbs. Not everyone who has diabetes will experience symptoms, and in some cases this is why they are not diagnosed. The most common test for diabetes is a simple blood test which will show where your current blood glucose levels are at. With or without accompanying symptoms, these blood tests will be able to tell if a person has diabetes. These conditions are manageable, so please be sure to discuss your treatment options with your health care provider.